Over 60 students from across England came together on 13 July at the Houses of Parliament for the inaugural Youth Debate on the role of religious education in schools. In the wide ranging discussion which followed – covering topics as diverse as the role of religious literacy in combatting extremism, the secularisation of schools, and the responsibility of society to ensure that young people are educated at school about the wide range of religions and beliefs in Britain – United Nations debating rules were firmly applied in the chamber by the debate co-chairs, students from Mulberry School for Girls in Tower Hamlets, London. Both young women demonstrated their expert training in handling their peers (and experienced politicians! ), and ensured that pupils from each school in attendance were able to argue their points during the debate. The topic of who should be teaching RE to children, and whether this should be left to parents, was also debated. Delegates argued that as with any other academic subject, it required subject specialists to ensure that RE was taught well. The former Secretary of State for Education, Nicky Morgan, who was in attendance for some of the debate, also spoke in favour of school-based, inclusive religious education, adding that RE was “one of the hottest potatoes for a Secretary of State to handle”! Many of the students managed to talk to their local MPs, who had been invited to attend the debate and hear what their local students had to say on the importance and relevance of RE in a modern society. 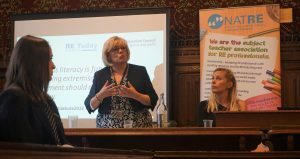 The debate was staged by the Religious Education Council for England and Wales (REC) and the National Association of Teachers of RE (NATRE). Archived tweets from #REdebate2016 can be seen here. NATRE is the subject teacher association for RE professionals in primary and secondary schools and higher education, providing a representative voice at national level and publications and courses to promote professional development. NATRE’s Executive consists of a majority of serving teachers. The Religious Education Council of England and Wales was established in 1973 to represent the collective interests of a wide variety of professional associations and faith communities in deepening and strengthening provision for religious education. It provides a multi-faith forum where national organisations with an interest in supporting and promoting religious education in schools and colleges can share matters of common concern. The REC’s vision is that every young person experiences a personally inspiring and academically rigorous education in religious and non-religious worldviews. It seeks to work in a way that embodies values of cooperation, collaboration, openness, mutual respect and critical engagement.